What a glorious surprise to find the large image of the 12th century Virgin of Eleousa (Virgin of Tenderness), sometimes also known as the Virgin of Vladimir! I am proud of you for choosing this image for today's feast, Father Fox, and for naming Mary with her truest title of Theotokos, Mother of God. Somehow many Roman riters have succombed to popular images of Mary which often look like Disney heroines or wannabe Barbie dolls with their long blonde hair, blue eyes, and pristine pastel garments. Mary could not have looked like this. Since we don't know exactly what Mary and Jesus did look like (though we can speculate from Isaiah's description of the Savior, and from common knowledge of the appearance and clothing of Jewish people of that time) it would be well for us to remain with the writings of icons where symbolic images direct us to Scriptural truth. We can immerse ourselves in truth while gazing at a symbolic beauty through which shines brilliant heavenly light. Relationship to icons is an important gift we can receive at any time from our Byzantine rite and Orthodox brethren. I wonder how Roman rite Catholics, many of whom love easy devotion, may be brought to understand that popular devotions sometimes actually cheapen that which they stand for and represent so inaccurately? I know devotion to an illusion is better than no devotion at all, but how wonderful it would be if we could all express our love and devotion in the light of truth and reality. 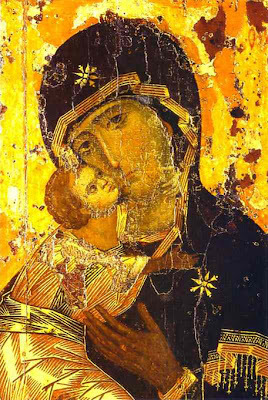 Thanks for the showing of this great Russian icon of Mary and Jesus. It all but jumps out of the computer monitor! I'm so glad you like it well enough to share it with your online followers! I pray that on the first image you have shown on this first day of a new year will remain with at least some in your parish and even draw them in to further appreciation of iconography. Interesting comments, Annie. I'm a new Catholic who much prefers good icons to most modern-day soft feminine pastel images of Jesus and Mary. I think I've been appreciating the "symbolic beauty" of icons without knowing that name for it. :) But most of all I tend to love medieval European paintings, many of which combine some symbolism with developing realism. My favorite image of Mary, meanwhile, falls in none of the above categories-- it's Our Lady of Guadalupe. I was stunned when I learned that she gave us that image herself. That image too seems to be highly symbolic, something 16th-century Aztecs would have appreciated.